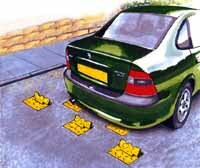 Traffic flow plates are designed to control traffic flow by allowing vehicles to pass over them in just one direction. They provide a simple, low cost, unattended means, of preventing vehicles from entering a site, car park, etc. via a designated exit point, thus improving safety and reducing the likely-hood of accidents. Ideal for use in one way systems, car parks, preventing residential areas turning into `Rat Runs`, etc. traffic flow plates are manufactured from heavy duty steel plate. Our surface mount flow plates simply bolt to the road surface, so are quick and easy to install. They feature multiple countersunk fixing points and rubber noise reduction bumpers. Our embedded units feature internal, sound deadening rubber bumpers, to significantly reduce the noise caused by their operation as vehicles pass over them (an essential feature when used close to residential properties). The box section is embedded in the ground whilst the gravity operated rising plate allows vehicle wheels to pass over it in one direction only. As soon as the vehicle has cleared the plate, gravity ensures the immediate return of the restrictor plate to the raised position. Standard or HGV Traffic Flow Plates? The standard Traffic Flow Plate is designed to effectively and safely control the flow of vehicles such as the family saloon car , small vans, etc. To provide an effective physical anti-flow barrier against vehicles such as HGVs, commercial vans and trucks or larger 4x4s, etc. an ultra heavy duty and much more expensive, specialist product will be required. How many standard plates will you need for a given road width?